Footy Almanac congratulates Jan Courtin, AFL Fans Association Fan of the Year (Female). Jan’s passion for her Bloods is renowned, we enjoy her regular contributions and her book, My Lifelong love affair with the Swans. Jan has shared her love for the Bloods. One more game Jan! Cheer Cheer! Born in 1943, Jan’s great uncle Jim Caldwell, captained South Melbourne’s 1918 premiership team. 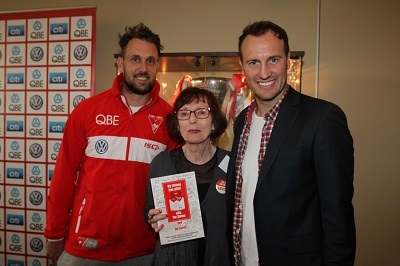 Born into a Bloods family, Jan attended her first match in 1948, when she was just four. She did not miss a game (except when at boarding school for a couple of years) for 20 odd years. When living in London in the 1970s, she abandoned a holiday in Germany with her mother to return to London to fly to Melbourne to see the Swans play in their first final since 1945, before going back to the UK. Jan arrived in Sydney at the end of 1998 and her team’s success has followed. Since then Jan has attended every home game and many interstate, and after retiring in 2010, she and her husband, Marshall, have travelled the country to attend every match, except a few in Perth. Jan also writes for The Footy Almanac and has released a book, My Lifelong Love Affair with the Swans, which was launched this year by Sydney club luminaries. Former chairman Richard Colless wrote the foreword. Jan donates 10 percent from the sale of each book to the GO Foundation, a charitable organisation established by Adam Goodes and Michael O’Loughlin to provide Indigenous children with scholarships to quality schools. Robert lives and breathes the Crows, coming from a strong Crows family. Robert spends many, many hours organising banners, flags, floggers and seating arrangements in the cheer squad for home games. He also helps organise tickets, buses and seating arrangements etc for interstate trips for the Adelaide Football Club fans. Robert goes above and beyond what is expected to make sure everything is perfect for the Club, the Crows Supporters Group members and the fans for every match day. Also on match day, once he has all the cheer squad gear sorted he then heads over to Crows Central to meet up with other supporters. Robert has even taken days off work to make sure everything is just right for away trips. When not at the footy, Robert is involved in many PR exercises for the club, fundraising, helping with the Crows Supporter Group Facebook page and answering everyone’s questions on the site. He works hard to keep fans informed about how they can be involved in the Cheer Squad. He attends all the Crows AFL games, even after being injured in a car accident at the start of the 2016 season. His biggest disappointment while hurt was being unable to wave his huge silk flag. The Crows Supporters Group has significantly lifted its colour and presence in recent years and is credited with encouraging more people to become involved in chanting and flag waving. This group goes above and beyond providing equipment, chants and banners on game day. Its members fundraise and support the club by cooking at BBQs for club sponsors. They also organise buses and tickets for away games. With hard work behind the scenes, the committee also secured cheaper bus fares for away games. This season they’ve set up and run Crows Central which operates pre and post home games. They also run raffles at the club post-match functions and assisted the club by helping put T-shirts on every seat at Adelaide Oval. They also organise the Sportsman’s night – a dinner for supporters and players. Essendon Cheer Squad was recognised for its loyalty in turning up week in, week out, despite much of its team being suspended due to the supplements scandal. Few cheer squads have endured such a negative period and the Essendon squad was nominated for displaying enormous dedication and still managing to have some fun during an extremely tough year. The cheer squad took it in their stride and never faltered. Its members remained loyal to a fault and have shown to be true supporters of their club. Well done Jan, much deserved! Congrats Jan. Will talk after Saturday and congratulate you with even more enthusiasm. Congratulations Jan. Hope Saturday tops off a great year for you! Fantastic Jan. Really good news and so well deserved. Thank you one and all. Completely unexpected! And a very big thank you to the Footy Almanac person/people who presumably nominated me. The most important part of the week is this Saturday. Congrats Jan. Many things contribute to making our great game the best sporting spectacle in the world,not least passionate supporters,across all clubs. Go Bloods. That is wonderful, Jan. Congrats! Keep up the good work and I hope you’re a very happy Jan on Saturday night! AS mentioned earlier, it’s really appropriate for me to thank the people who nominated me. Your support for Sydney is quite noticeable in your postings . It would be good if the AFL could take notice of supporters. When you see the allocation of seats for the Grand Final with only 15,000 going to the supporters of the two sides, yet 17,000 corporate’s being allocated you know the corporate tail wags the dog. good to see supporters being recognised, because it’s the supporters that have made the game what it is. Good luck to your team tomorrow. Good luck to supporters of both Grand Finalists. Congratulations Jan – fine recognition of the value others put on something you do and love. Totally agree about the fans, Glen. As Richard Colless said, there would be no game with the fans. Sorry I didn’t get to say hello at the GF Lunch today, David. Dave was taking me to your table when John started the chats on stage, and when we left, couldn’t see you around. My error! “Without” the fans! You are a very passionate Swans supporter. The club is happy to get your massive support. And it’s great to see your book published. Fan of the year is nice, but, very sadly, footy team of the year would be better! !